HAGERSTOWN, MD — Head Start of Washington County has purchased a church building at 837 Spruce St. in Hagerstown and plans to consolidate some of its operations there, Executive Director Paul G. Pittman Jr. said Tuesday. Cornerstone Community Church, formerly known as Hagerstown Grace Brethren Church, sold its building for $1.3 million last month. Pastor Harald Bjerga said the church, in turn, has purchased the former Homeplace Everlasting property in the Beaver Creek area. The shop and barn on that property are smaller than the Hagerstown building and will be a better fit for the church, Bjerga said. Head Start of Washington County is part of a national program that “promotes school readiness by enhancing the social and cognitive development of children through the provision of educational, health, nutritional, social and other services to enrolled children and families,” according to Head Start’s website. Pittman, in his 34th year with the agency, said it has grown in Washington County from serving 29 children to serving nearly 500. Head Start currently has four centers in Hagerstown — at Elgin Station on Elgin Boulevard, the Martin Luther King Center on West North Avenue, Noland Village on Noland Drive and the Westshire Center on West Washington Street. There is a home-based program, as well. 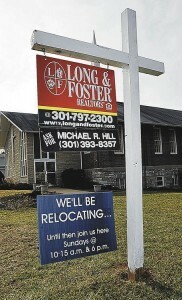 Head Start’s administrative offices on Memorial Boulevard in Hagerstown will move to the new home on Spruce Street. Pittman said Tuesday that he wasn’t ready to say which other operations will move. “It’s a once-in-a-lifetime opportunity,” he said. He said Head Start is getting funding to bring the church building up to code, which includes installing a sprinkler system. It’s not clear how much that will cost. There was a day care program at the church — Grace Child Care Center — until the program closed in June 2010. Bjerga said Grace Child Care Center, a ministry of the church, closed because of dropping enrollment. The church plans to move from the Spruce Street building by the end of July, he said. Cornerstone Community Church averages about 55 people in its congregation — a “small but mighty crew,” Bjerga said. It’s been expensive for a congregation of that number to have a church building of that size. The Maryland Department of Assessments and Taxation records list the building as having nearly 39,000 square feet, including the church and parsonage. The church will use the former Homeplace Everlasting shop as an office. Bjerga said the church might remodel the barn on the property for services, but that hasn’t been decided. The church eventually would like to make the property available for community events and weddings, he said. Congratulations on the sale. We pray that the new facility and fresh start in a new neighborhood will help the church to move forward in fulfilling the Great Commission both in Hagerstown and around the world. Our prayers are with you as you move. We send our love to Pastor Harald, Kim and the church family.